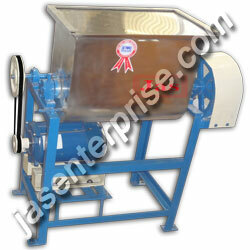 Excellent mixing results are achieved in short time, batch after batch. 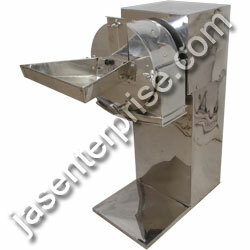 Slow and gentle, the single / twin paddle mixer also saves you installation cost, space energy cost. 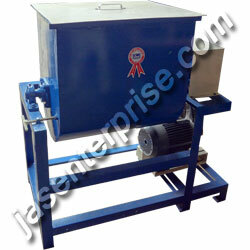 The mixer provides homogeneous mixing, gentle mixing, low maintenance, minimum heat generation etc. 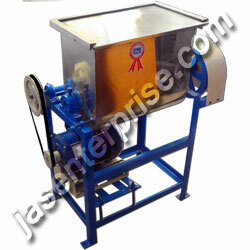 Paddle mixer consists of several elements: a centrally mounted horizontal shaft that rotates within a cylindrical container, paddles, plough or other shaped mixing elements that are attached to the centrally mounted shaft, special openings at the top for feeding materials, manually tilt able tank operated, inside a cylindrical conduit and a complete drive unit. 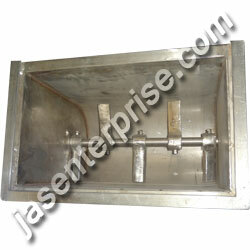 These are horizontal paddle mixers utilized for blending dry material, powdery granular, short fibered, moist solids and liquids together with pasty substances up to and including highly viscous masses. Pastes and filter cakesLiquid addition is possible through spray bars. Cakes and pastes are usually thick and resist blending without a proper mixing design. The mixing action of the bent paddle design effectively moves materials such as pigment, minerals, ceramics, chemicals, and pharmaceuticals. Contact parts of the mixers can be polished to any level to help release these sticky materials for minimal batch retention during discharge. 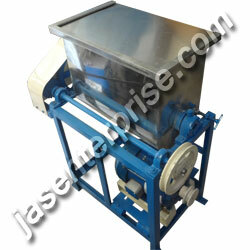 This machine is most useful for noodle, vermicelli, papad making machine. Abrasive materialsAbrasive materials present a unique challenge to mixing equipment. Standard mixers can wear out quickly when processing abrasive materials. 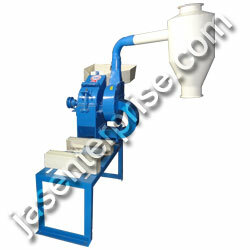 Our line of paddle mixers has the solution. Our special paddle design gently lifts and pushes material producing a gentle cascading action, thus reducing the wear of the agitator. The welded paddles allow for easy wear compensation and eventual replacement. 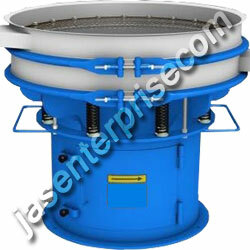 This lengthens the useful life of the agitator while reducing overall maintenance costs. For especially aggressive materials, we can make the paddles from abrasion resistant steel and install abrasion resistant liners for the tank. 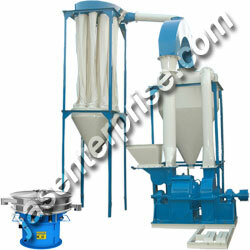 Animal feed Our blenders are widely used in feed mixing industries creating uniform mixes efficiently. 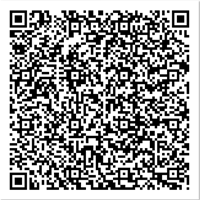 We understand that health of an animal can be dependent on mixes being accurately and uniformly blended. Arms: - thick mild steel / stainless steel - machined plates mounted on main shaft.